Civil engineering is a by-the-people, for-the-people profession. In the most fundamental way, civil engineering is what keeps society working. 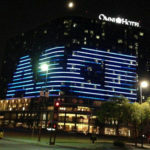 So, to consider 100 years of civil engineering history is, first, to consider 100 years of a lot of people’s good work. 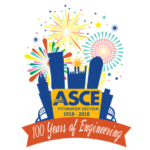 This is what makes the centennial celebrations of ASCE Sections so special. 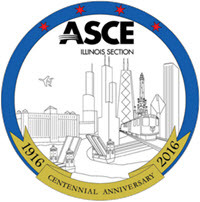 This year, four Sections are commemorating 100 years – Illinois, Michigan, National Capital, and Utah. It has been a crazy centennial for Illinois Section organizers in that the president recently had a baby and the president-elect moved to Minneapolis. No worries. The celebration went off without a hitch. Thera Baldauf, chair of the Centennial Anniversary Committee, Gora and their team began the process by sending out surveys so that they could cater centennial events to member requests. “It’s their anniversary,” Gora said. 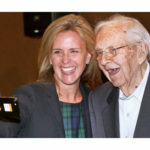 The Illinois anniversary celebration actually began last year with a kickoff event at the Section’s annual dinner at Adler Planetarium in Chicago. The Section hosted a scavenger hunt for Younger Members, as well as a boat tour on the Chicago River. The President-Elect and Scholarship Dinner in the spring also celebrated the anniversary. Chicago’s rich civil engineering history gives the Illinois Section plenty of accomplishments to boast about, as noted on the centennial website with a timeline that lists out the history of Chicago civil engineering, going all the way back to 1831 and the construction of the city’s first bridge. The history of the Utah Section is unique among the four centennial Sections this year in that its infrastructure has changed the most in 100 years. Utah released its Infrastructure Report Card in 2015 and used the centennial occasion to revisit those results. The Section also received a proclamation from the governor, honoring its 100th anniversary. The Section’s major project for the year has been a 40-page e-book celebrating the state’s civil engineering history. It is available to read or download on the Section website. 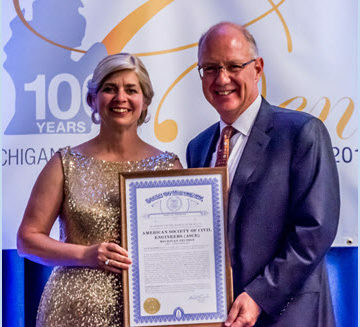 The Michigan Section celebrated with a centennial gala dinner in May at Cobo Hall in Detroit, as part of its Michigan Infrastructure Conference. “Michigan has a legacy of leading the way in civil engineering,” said Section President Therese R. Kline, P.E., M.ASCE. The Section that formed in Detroit in 1916 witnessed the boom, bust, and boom again of the state’s automobile industry. Today, Michigan is “on the cutting edge of the autonomous car movement,” Kline said. The state also has several famous bridges, including the Mackinaw Bridge, and lays claim, of course, to some of the nation’s most precious water resources. Eight previous Section presidents were among the attendees at the Gala. Michigan Department of Transportation Director Kirk Steudle presented a framed certificate recognizing ASCE Michigan’s 100 years of service. 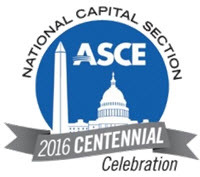 The roots of the National Capital Section go back a little further than 100 years to a group called the Washington Society of Engineers that transitioned officially in 1916 to ASCE National Capital. 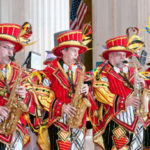 The Section’s centennial celebration centered on a conference in June at the National Press Club in Washington, DC, featuring an impressive array of speakers and presenters. Maj. Gen. Mark Yenter, P.E., M.ASCE, the deputy commanding general for military and international operations, U.S. Army Corps of Engineers, was the keynote. ASCE President Mark Woodson, P.E., L.S., D.WRE, F.ASCE, Walter “Butch” Waidelich Jr., P.E., executive director of the Federal Highway Administration, and Barbara Rusinko, P.E., president of Bechtel National, were among the other speakers for a program that covered a variety of civil engineering disciplines and issues as well as highlighting ASCE initiatives. The Section has focused on outreach with much of its centennial work. A major push to that end is a coffee-table book aimed at, not only civil engineers but also, the general public, particularly students. 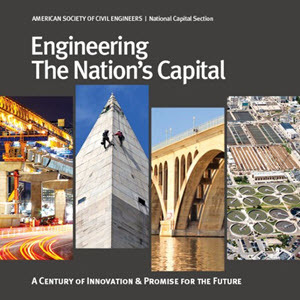 The book details Washington, DC, history – the layout of the city grid to the monuments to the local civil engineering treasures – while also celebrating ASCE and civil engineering as a whole. The Section is working to get it in local libraries, schools, and museums. It is available for purchase online.